TLS (Transport Layer Security), also known as SSL (Secure Sockets Layer), is a method of encrypting your communications so that other parties cannot tamper with or read your messages. It is suggested that you connect to Rizon using encryption if possible. Instructions on how to do this are provided for many popular IRC clients below. All Rizon servers allow SSL connections on port 6697 and 9999. 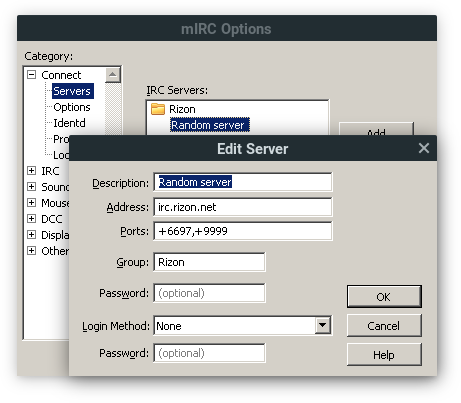 You can connect securely to Rizon by setting your client to connect to irc.rizon.net with either port 6697 or port 9999. Client-specific instructions are listed below for your convenience. Example of what your mIRC settings can look like. Example of what your HexChat settings can look like. 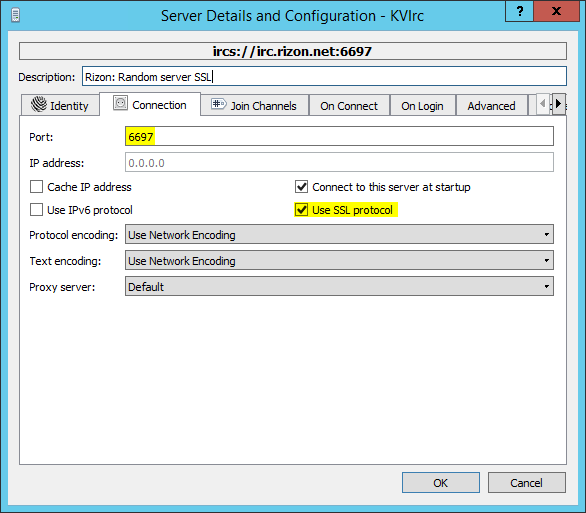 Example of what your KVIrc settings can look like. mIRC's official documentation can be found here. SSL on KiwiIRC can be used by clicking on the Server & network link in KiwiIRC's client. Allowing the user to select SSL and a separate port. SSL can be used via Mibbit by clicking on the "Server" link on the connection dialogue and by using "+6697" as the port. Rizon's QWebIRC automatically uses SSL when connecting via https. To make sure Irssi uses SSL and verifies the authenticity of the certificate you need to enable certificate verification. You can do this by connecting using the -ssl -ssl_verify flags. Users of version Irssi >= 0.8.21 are encouraged to use -tls -tls_verify instead. To make sure weechat verifies certificates, you'll need to use the following. You'd then use irc.rizon.net/6697 or irc.rizon.net/9999 as the server address. After logging in to the webpanel, go to Your Settings → Networks → Edit. Make sure "Servers of this IRC network" is set to irc.rizon.net:+6697. You may need to reconnect your client to activate the new settings. You can do this by typing /znc jump after connecting to your ZNC. The instructions above make sure you are connected to the IRC network using SSL. To make sure your connection to your ZNC is using SSL as well log in to the webpanel as administrator, go to Global Settings → Listen Port(s), and make sure that the SSL checkbox is ticked. You can now connect using SSL to your ZNC on that port. RizonBNC allows SSL connections via port 12345 only. Nick using irc.rizon.net - Where are you? Nick End of /WHOIS list. 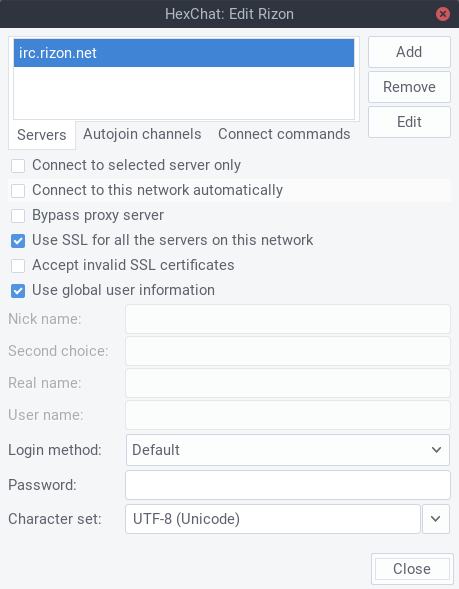 Channels can be set to only allow users that are connected using a secure connection. This can be enabled by setting the channel mode +S. SSL certificates can be used to automatically identify with NickServ. This is a separate concept than what is discussed in this article. Read more about this on the CertFP or SASL EXTERNAL page. This page was last modified on 2 April 2019, at 03:00.